The planning inspector has now published his decision on the 32 houses off Hawarden Road and decided to allow the appeal. That means planning permission has been granted for 32 new houses on Hawarden Road including a small Childrens play area. Flintshire County Council did not request any financial contributions for the community nor for schools. The only direct benefit to the community will be some new affordable homes - 30% of the 32 houses will be affordable. The inspectors report was fair in the circumstances and he listened to the concerns of the community over the impact of over-development and the other applications outstanding. Unfortunately, the local authority had told him they didn't think there was a problem and offered no defence; and with the Welsh policies leaning heavily in favour of new houses, he was left with little option. This decision weakens the defence for all Flintshire communities because it has put very little weight in Flintshire's existing planning policies and therefore every field is vulnerable. The inspector has done us one favour in making a prompt decision because that means that any consideration of other new sites (and where decisions have not yet been made) will know that another one has been approved in Penyffordd. The developer of this land have 2 years to start building. Thank you to everyone who took the time to write in their objections or to attend the inquiry. A full planning application has been prepared for 435 houses in Buckley. The site is close to Bannel Lane and will bring the urban area of Buckley much closer to Penymynydd. This development represents around 1,000 new residents and will obviously need additional school and healthcare capacity. After 18 months - Have we achieved anything? 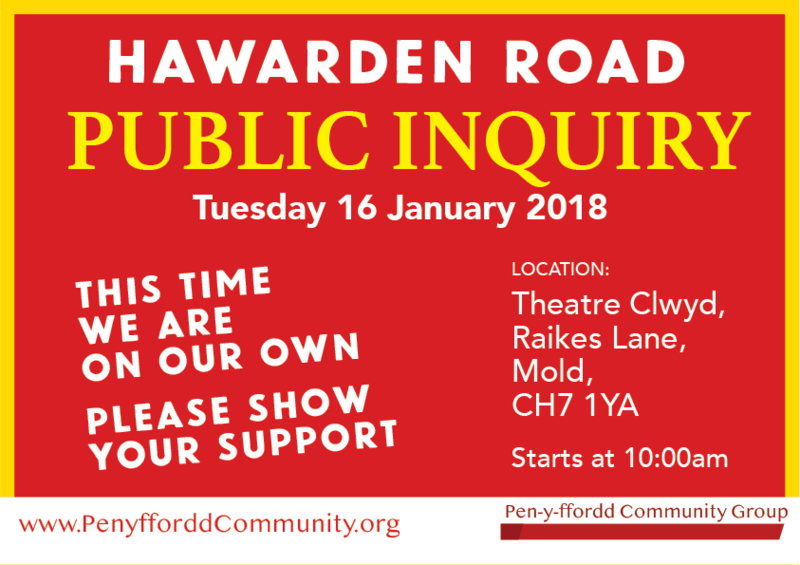 The inspector at the most recent Public Inquiry (Hawarden Road) asked about the Penyffordd Community Group - who are we? Are we a formally constituted group? No. We are a group of residents who care about the place where we live. The huge interest in building in Penyffordd is absolutely nothing to do with the 'housing crisis'. It is a consequence of a technicality in Welsh planning law combined with Flintshire County Council's failure to have a 'current' local development plan (LDP), which is their statutory duty. The Welsh law allows for the 'presumption in favour of development' - meaning that landowners and developers can apply for planning permission on any land they want and stand a good chance of getting it. Penyffordd had two sites allocated in the last plan process - the Groves and Heritage Park, and when they are added to Meadowslea and latest Rhos Road site, the growth of the village in less than 10 years is over 30% (the recommended growth was between 8 and 15%) - Penyffordd has had higher growth than any other town or village in Flintshire. Done properly, land selected for development through the plan process, is considered strategically and the public consulted. Right now, land is being chosen at the whim of developers. The (UK) average land value per hectare rises from £20,000 to £6m with planning permission, so it is not entirely surprising. Very many residents of the village enjoy community living. The sense of feeling safe, trusting your neighbours, enjoying active social groups, clubs and teams. We enjoy well organised village events and good facilities (mostly). The recent rate of growth has meant an increasing number of residents not getting involved or realising there is a community here for them to be a part of. There has been a noticeable change for the worse for many residents and we are asking for time to allow the community to strengthen again and connect with everyone. We have a fabulous community spirit and we don't want to lose it. - We have met with FCC, with neighbouring communities, with Welsh Government and our local AM and MP. - We have established a website with over 35,000 views. A Twitter account, Facebook page and Instagram account to promote the village. Have we actually achieved anything? We helped to get it refused unanimously at committee (after a recommendation for refusal by the Planning department). We vigorously defended the appeal at Public Inquiry. Over 300 residents formally objected and many attended the Public Inquiry. We are waiting for the decision from the Welsh Minister. We got it refused at committee (unanimous apart from one abstention), despite a very forceful attempt by the Planning department to get it approved. We vigorously defended the appeal at Public Inquiry without any support or defence from Flintshire County Council. 165 residents formally objected. We are waiting for the decision from the Planning Inspector. We put enough pressure to persuade the developer to withdraw the application. We have applied considerable pressure to get the best possible development for the community - permission was granted on appeal in August 2016. We are waiting for Flintshire County Council to decide on the amendments to the plan, including affordable housing provision, community contributions, final layout and drainage plans. We have applied significant pressure to resist the application as it stands because it is not in the best interests of the community. We are waiting for Flintshire County Council to make a recommendation prior to planning committee. We had meetings and site visits with Hanson and hosted them at a village meeting so that they could explain their proposals. We didn't formally object to the proposals because views of villagers was mixed, with many hopeful of a reduction in noise and an increase in employment. We did ask for some planning conditions to protect nearby residents from. nighttime activity but were unsuccessful. We continue to monitor what is happening at the site. Work is due to start this year. We have rigorously engaged with Flintshire on the design and traffic scheme for the school - the design is much improved and the traffic remains outstanding. Again we hosted FCC at our pubic meeting to share their plans. We are waiting for Flintshire County Council to finalise the transport recommendations before it goes before Committee for approval. We quickly and strongly opposed the building of Council houses behind West View without full public consultation. The plans were withdrawn by Flintshire County Council. We have been talking to the Flintshire team for some months to try and ensure the very best development on the site, with positive results. The final plans are ready and this will go to public consultation in the next few weeks, with our support. We have met with the developers to discuss the detail and express the views of the village - we have tried to persuade them to follow the LDP process i.e. 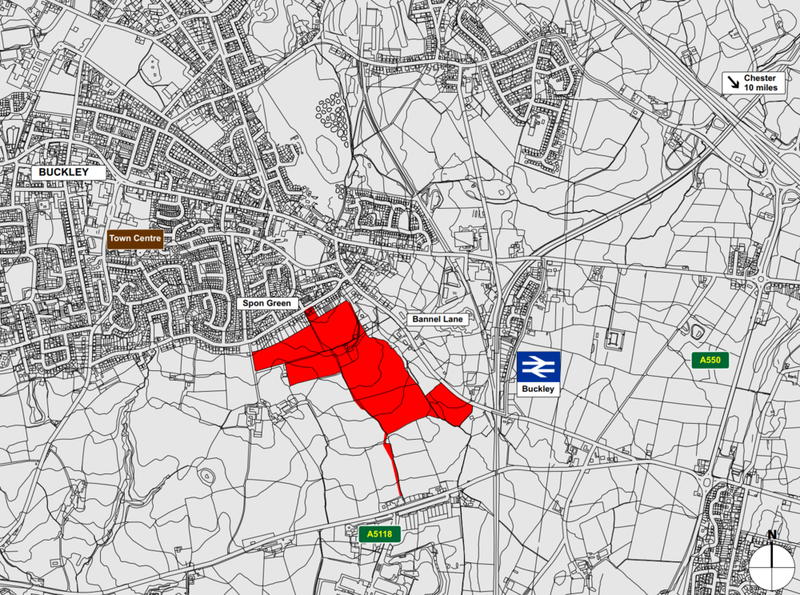 have that site considered in the wider context of Flintshire's strategy and the other sites proposed around Penyffordd. The pre-application public consultation is over and we are awaiting the decision of the landowner on whether they will proceed with a full application. We have expressed the view that the site should not be expanded and there is a threat of future change of use to residential use i.e. housing. This planning application is with the Planning Department currently and awaiting their recommendation. We have been pressing for the derelict medical centre site to be developed for housing - there are plans in place but a dispute remains over community contributions. It is with the Planning Department. We are supporting the Community Council to look at possible Community Asset Transfer to bring the management and maintenance of the Youth Club into the village and take a wider view of the future of the site to meet the needs of everyone who uses (or could use) it. There are conversations ongoing between the Community Council, Institute Committee, Scouts and Flintshire to decide what to do next. All the while we have been supported by many many residents and that is why it is the right thing to do. Residents have attended public meetings, written objections, attended the planning committees and public inquiries and engaged in the debate online. Thank you for your support. And if you believe we do not represent your views then let us know or come along to the next public meeting (we hold public meetings to share news, ask for help and to ensure that we are representing the majority voice of the community). We do everything willingly as volunteers and whilst we accept that there will be some in the community who disagree with some of the things we do or say, we hope that it is understood that what we do is intended for the benefit of the community as a whole. We are trying to strike a balance for a diverse community. The draft Place Plan sets out the vision for the Community between now and 2030. It covers planning but also transport, economy, environment, social and environment - it aims to feed into Welsh Government objectives for Wellbeing and guide the Community Council and outside agencies on changes and exceptions that reflect the individual needs of our community. The draft Place Plan has been a really invaluable resource to refer to in both Public Inquiries but also where the Community Council have been responding to consultations and considering smaller applications. It is now owned and adopted by the Community Council, but not yet by Flintshire. For it to work, it has to evolve as the village changes, so must the Plan reflect those changes to remain current. The 2018 draft will be published in May and in the meantime, we need to ensure that what it contains continues to reflect the needs and views of the community as a whole. Please take the time to review the current draft and let us know if you believe anything is missing or needs to be updated. There are two more years before Flintshire adopt their Local Development Plan (they will be the last in Wales) - two more years for landowners and developers to try and get planning permission on their land. We are actively pushing Flintshire on our Place Plan - it has been a real benefit to our defence so far - but we need Flintshire to work with us to finalise it and get it adopted as Supplementary Planning Guidance. We remain on alert for more developments coming forward and for the next stage of the outstanding ones to be resolved. We are not a closed group and we welcome new support - we really need people who are prepared to dedicate a bit of time to do things - we are reading and monitoring all the time. We are writing and following up correspondence with Welsh Government, Flintshire County Council, statutory bodies and developers. We are putting up posters or posting leaflets. if you are interested in getting involved in any way at all, please get in touch. There is a new application for changes to Bank Farm, Chester Road, Penymynydd to add to the current space by incorporating the adjacent field to enable HGV access from a new entrance on Lower Mountain Road. Full details are on the Flintshire Planning Portal. Given the history of the site, some people are concerned that this is a way of increasing the available 'brownfield' land to enable future change of use to residential. If you are a user of Lower Mountain Road, by car, bike, horse, running or any other way, you may be concerned about HGVs manoeuvring close to the entrance to Chester Road. We had our second public inquiry in as many months, but this one was very different. What was said at that meeting was classified as privileged information and we do not know the content. There are no houses immediately to the south and most of the land to the south is farmland. Unfortunately the developer saw the Redrow inquiry and concluded that with a new Primary school due in 2019 and secondary school capacity at Elfed, there is no shortage of space and so they will be making no payments. In discussing the school contributions the Council also took a curious position. Rather than calculating the number of available school places on the numbers known today. They presumed that the planning application for the new school would be successful and that the funding application to Welsh Government would also be successful. The consequence of these two assumptions was the loss of a £98,056 to Ysgol Penyffordd. So our village children could be split between Elfed and Castell Alun and no one cares. The Local Planning Authority could have included a ‘Community Infrastructure Levy’ as part of the same S106 agreement but failed to do so (a CIL could contribute £1,100 per property towards community projects i.e. £35,200). The public inquiry was held this week at Theatre Clwyd in Mold despite the fact that the Legion, the Institute and the Flintshire owned Community Centre (Youth Club) were all available. A handful of residents did make it to show their support and we thank them for making the effort. The inquiry consisted of the appellants team, a Barrister and two expert witnesses, one a landscape witness and the second a planning expert. Flintshire sent a barrister and the planning officer, Flintshire County Council’s solicitor was there some of the time. Flintshire’s Barrister did not present a case. She appeared to be there to protect the Flintshire planning officer. Together they only became animated when the discussion moved onto the details of the application were it to be approved. Prior to 6th December, Flintshire had appointed Eden Planning Consultancy to prepare their case. Eden had submitted a statement of evidence which contained much of the same background information as the Redrow submission (by the same company). At the beginning of this appeal, Flintshire’s Barrister instructed the Inspector that he could disregard that evidence as it no longer represented Flintshire’s case. The Inspector indicated that he had read it and had questions arising from it. It was our only ‘professional’ defence on record. The appellant repeatedly referred back to the position of the Local Planning Authority in recommending refusal and the Planning Committee in withdrawing their objections. It will be interesting to know what was in the public interest that we didn’t hear when so much harm was done resulting from what we didn’t hear! along with Mrs Randall, who lives opposite the site. Cllr Heesom from the Planning Committee also attended the inquiry in support. The inspector was very reasonable in allowing us to cross-examine and provide evidence. Unfortunately, the community had no expert witnesses or Barrister to argue our case, though the Questionnaire and Place Plan gave us a solid defence. We were facing a planning specialist Barrister from Kings Chambers. One of the things that came up in evidence was that, in preparing their planning statement, the local authority had approached the Welsh Government land unit to assess the land – the threshold for approaching Welsh Government is 20 hectares – significantly more than this site – so why did Flintshire approach them if it was not to try and defend their recommendation to refuse? This land classification would have saved the field in Higher Kinnerton that is being built on right now (56 houses). - It’s not very much land (even though it is classified as Best-And-Most-Versatile land, protected by policy). - School places is a matter for the Council’s admission policy – what’s wrong with Elfed? The Council agree with their position. So we’re not sure where that leaves us with future applications. We await an update on Rhos Road (South) and the final conditions on Rhos Road (North). Vounog is yet to be submitted as a full application. On both Hawarden Road and Redrow, we are in the hands of the inspectors now and on this one his decision will be final – this application does not go to the Welsh Ministers (unlike the Redrow one). - Flintshire’s planning department recommended approval of the application before July 2017 planning committee. Because there had been no site visit, the committee deferred it until September. - In August the developer lodged an appeal to the planning inspectorate for ‘non-determination’ because they thought it would be refused so they might as well appeal anyway. - At September’s planning committee it was strongly refused – despite severe pressure from the planning officers – 5 of them spoke to the committee to tell them to approve it. - At December’s planning committee, behind closed doors, the committee were spoken to again and withdrew the refusal. The initial consultation by the developer on Vounog Hill closes on the 26th December. The 28 day consultation is now a statutory requirement of developers before they submit a planning application. Your responses to the developer should be listened to and taken into account in the final designs before they are submitted to the planning department. If you are objecting to the development completely, then write to tell them that. You don't need to say why, just object. If you believe there are improvements that can be made to the layout, design, housing mix, access or anything else that they could reasonably change, then you should include the detail and see if they are prepared to make the changes. The next stage is the full planning application (expect that in late January / early February). When the public consultation opens, then we have to get as many people as possible to object - and refer to planning reasons and policy reasons why it should be refused. We will be holding a public meeting in early January and we will go through the details then. The Flintshire LDP is in its next stage of consultation. They are asking us to consider their strategy for growth - the number of houses needed (7,645) in Flintshire up to 2030, and where and how they should be distributed (according to sustainable principles). They have also shared the first assessment of the extent to which they believe that individual 'candidate sites' comply with that strategy. In Penyffordd they are saying that 2 sites completely comply - the remainder of Wood Lane Farm and a smaller site at Beverley, close to Meadowslea. All the remaining sites around the boundary of the village are partly in compliance with the strategy - these include the Hawarden Road and Redrow sites. The only ones which are not compliance are those detached from the settlement such as Bank Farm and down Terrace Lane. The Penyffordd Community Group have prepared a detailed response to the whole strategy and have been looking in detail at how other settlements are being considered. 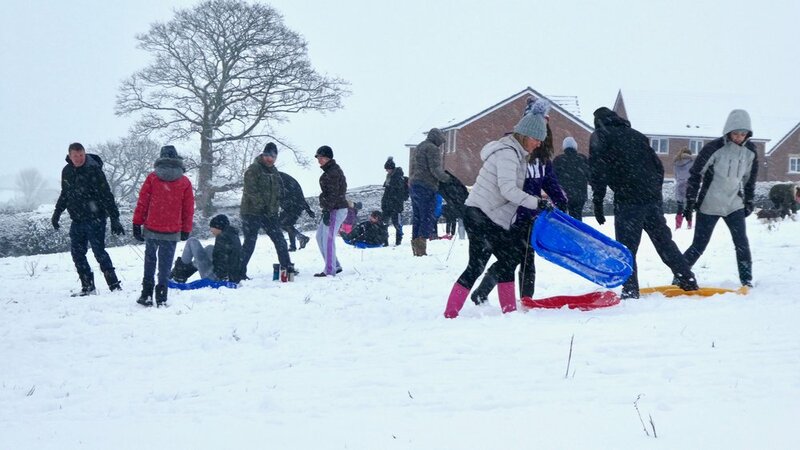 Our belief is that Flintshire need to work with communities, agree a scale of likely development and, through Place Plans or community engagement, involve the communities in working out where to put the houses. If distribution is equal, villages like Penyffordd would only be taking around 50 additional homes over the plan period. If you have any comments about our response please email team@penyfforddcommunity.org or comment via this website. We will submit this response before the Thursday 21st December deadline. The Preferred Strategy makes provision for a level of growth comprising 8-10,000 jobs through some 223 ha of employment land, supported by a housing provision for 7,645 new homes to meet a housing requirement of 6,950 dwellings. This represents a mix of Option 4 and Option 6 from the Strategic Options document. Do you have any comments to make on preferred level of growth? 1.1 It would be useful to confirm that the growth target number is for the whole plan period – 2015 t0 2030 and that includes sites developed since 2015. A best estimate would put that at around 1,500 dwellings to December 2017 have been built. If this is taken into account and the 1,600 homes on the two strategic sites, are we correct in presuming that we are looking for land allocation sufficient for 4,500 – ignoring the sites brought forward in 2018, 2019 and 2020 prior to the plan adoption – potentially another 1,500+ homes? 1.2 Does this mean that less than half of the candidate sites will comply with this strategy in a planned way? This suggests that the council must take steps to proactively manage sites that come forward ahead of the plan to ensure that they are aligned with the strategy for the future. That is only possible if more detail is forthcoming about the assessment of the sustainability of settlements and the expected growth by location. 1.3 Worded differently – this says that if we have to accept that your delivery timeline is slipping for reasons beyond the authorities control, then we are saying that the authority need to take active responsibility for managing development in line with the strategy prior to adoption – in an accountable way, rather than being driven by the commercial interests of developers. 1.4 It also suggests that more resource is needed to complete the plan earlier. While the reasons for the delay July 2020 have been published, every effort must be made to bring forward the timeline, either by bringing in more resource or by collaborating with authorities who have completed their plans to short-circuit some of the background policy work. 1.5 The latest instruction from Cardiff is for adjacent authorities to produce joint plans. Although Flintshire and Wrexham are not included in that instruction because at this time they have not completed an LDP, there is an opportunity to share resources, particularly around external consultants and policy definition. 1.6 With so many communities actively engaged in the process, can some of the candidate site assessment and suitability work not be done in collaboration with Community Councils? The use of Place Plans as supplementary planning guidance could have their place, providing they are aligned with the LDP strategy and could make it more effective at a local level. 1.7 If communities had a sense of the anticipated scale of development expected of them, then they can prepare the residents with communication and start the debate about the most suitable sites (see Appendix 1). Currently, there are communities across Flintshire viewing the map of candidate sites around them and offering resistance to all in fear of the potential scale that could come their way. The last reference for population in Flintshire is 148,600. The 2011 census based WG projections indicate that Flintshire’s population is only likely to grow by 2% over the plan period for the LDP. This is due to a combination of changes in the trends for both components of population change i.e. natural change (births and deaths) and migration. Positive natural change is slowing down (more births than deaths) and migration change is neutral. These projections however may be an underestimate as they used recession period trends with which to project forwards. Flintshire’s population age structure is ageing which will have implications on the demand for new housing as well as more specialised types of housing need. In terms of housing provision, the UDP plan period covered the years 2000 to 2015 and that Plan set out to 4 provide a housing requirement of 7,400 homes or 493 homes per annum. That requirement has not been met and is unlikely to be as we approach the end of the Plan period. This will have implications for the Local Development Plan housing requirement figure. 1.9 Every one of the last 4 decades has had a recession at some point – each for different and not repeated reasons. It is reasonable to expect there to be at least one period of recession in the plan period, not least with the knowledge that we have Brexit and relatively unstable government. A great deal of employment locally stems from Airbus and its feeder businesses which in turn are dependent on the trading relationship with the EU. 1.10 Even allowing for the strategic economic jobs creation, these figures feel high when compared against what has been delivered from the UDP allocations and the forecast population growth. 1.11 We have a concern that we are looking at figures to satisfy Cardiff and National needs, rather than reflective of deliverable and sustainable targets for Flintshire. The Preferred Strategy is based on Option 5 of the Strategic Options Document, ‘Sustainable Distribution plus a Refined Approach to Rural Settlements’ whereby growth is directed to the top three tiers of the settlement hierarchy and in the bottom two tiers provision is focussed around meeting local needs. 2.1 Like many, we agreed that the most flexible Spatial option was the most realistic and that growth-by-numbers has not worked under the UDP. However, at this stage, it all feels very vague. Allocations will depend on the settlement banding, the sustainability of individual settlements (though with 5 bandings settlements are very different and have experienced very different growth under the UDP), market forces, jobs and transport hubs – there is barely any narrowing of location based on the strategy. 2.2 Any infrastructure provider, housebuilder or indeed residents wishing to purchase or move have no idea where Flintshire plan to build their 7,645 houses, aside from on the Airfields site and Warren Hall. 2.3 Is there any evidence base of these jobs coming forward realistically in the plan period? Based on recent development history, it is easy to foresee the Flintshire borderlands becoming a dormitory for Cheshire, Manchester and Liverpool professional workers. We would prefer a more cautious approach with the plan reviewed if employment on this scale is forthcoming. 2.4 Reference to wiping the slate clean (in reference to adding on unused UDP sites) makes sense to some extent. However, where there are brownfield sites which should be developed before encroaching on open countryside, those sites should be included and every effort made to bring them forward. Limiting the supply of green field land will act as an incentive to builders, particularly smaller local builders. 2.6 There is clearly a failing of the plan methodology in the UDP. The adoption of the UDP is relatively recent and therefore lessons have to be learned about why these sites have been through the UDP process, including the public inquiry, and not come forward in such high numbers. There is no reference to these lessons or understanding of why the problem exists. Without this learning it is reasonable to be concerned about some of the same assumptions being carried into sites in the new plan. Just saying that we are not allocating ‘by numbers’ is not enough. 2.7 It is not clear to what extent the reason for the recent non-development of UDP sites stems from TAN1 and the consequent ease with which developers have been able to identify more lucrative and cost effective green field sites, outside of the plan. 2.9 What does this mean? Is the plan to allocate sites beyond those needed to meet the preferred growth target and if that is the case, is there a risk that the most commercially viable settlements will consequently carry a disproportionate share? - Defined Villages will be the focus for a flexible and sustainable approach to delivering local needs affordable housing. - Undefined Villages will be limited to small scale infill or rounding off for local needs affordable housing. Flexibility – need for additional sites?? 3.3 Are the planners alone deciding on sustainability of each settlement or are other statutory consultees being involved? Given the state of healthcare provision and public transport rumours of reduced services not to mention broadband, sewerage capacity, water supplies and school provision, the voice of local communities through Place Plans or consultation must carry significant weight due to their unique local insights. 3.4 We believe that there must be a more detailed assessment of settlements in existence which takes these factors into account and therefore we should be able to assess the likely level of development in each settlement individually – subject to the final detailed assessment of the potential candidate sites? 3.5 It is not clear what the detailed criteria were in the green / amber / red assessment of sites as they correspond to the spatial strategy. In our analysis (Table 1 overleaf), which removes duplicate sites as far as possible, it can be seen that the Sustainable Villages have substantially more ‘Green’ sites than the Local Service Centres. 3.6 We can also see that there is a significant shortfall in ‘green’ sites when compared to the overall need. Does this suggest that all of these green sites are likely to go forward into the adopted plan and that there is the need for some of the Amber sites too? 3.7 Although accepting and acknowledging the desire not to allocate by numbers – there has to be a baseline estimate how they will be distributed as a starting point – whether it is published or not. 3.9 If we assume that most people want to live in and around services, then the greatest distribution would be around towns – the Main Service Centres – we have estimated 40% of the target homes for those 8 settlements – or around 302 homes each. 4.0 We have allocated 30% to the Local Service Centres – so each of those 7 settlements would receive 259 homes. Finally, we have allocated 20% to the Sustainable Villages – so each of the 22 villages would receive 55 new homes each. 4.1 These are baseline figures only – clearly when we take into account existing commitments, proximity to transport nodes and employment then some settlements are likely to deliver more and others less and we also recognise that not all ‘sustainable villages’ are equally sustainable – but this is a reasonable baseline. 4.3 So the top and third tier green sites are almost exactly what is needed based on the available Green sites. Local Service Centres are significantly under. Of the 8 Main Service Centres, Flint has 1,598 homes in ‘green’ sites – 68% of the total. 4.5 If we consider the reference to employment and transport nodes, then it would be expected that those locations closest to the Deeside Enterprise Zone, the A55, A494 or train stations would have higher allocations. 4.6 Connahs Quay (Main Service Centre) has 105 ‘Green’ homes. Saltney (Main Service Centre), Queensferry (Main Service Centre) Hawarden, Broughton, Garden City, Mancot, Northop, Northop Hall, Drury, Bretton and Sandycroft (Local Service Centres), all of which are close to employment and transport links, have no Green sites. 4.7 Reference to the settlement hierarchy as it affects Hope, Caewgrle, Aberborddu and Cefn y Bedd (HCAC) doesn’t make much sense when taken in the wider context of the available candidate sites and other policy matters such as active travel. These settlements are geographically distinct and it is not realistic to expect residents to walk between them (they are served by three separate train stations). 4.8 Although they have been grouped together since the Alyn and Deeside Plan, that in itself is not justification alone. The UDP inspector did not find a problem with the single boundary but setting that boundary was not a primary concern of the inspector. The purpose of the LDP is to identify sites suitable and sustainable for development. It is not clear how considering four distinct settlements as a single settlement helps with the Wellbeing and Cohesive Communities goals. 4.9 In reviewing the wider figures, it would be useful to understand better what criteria have been used and how those criteria have been applied in relation to the Spatial Plan, because the numbers do not reflect the wording of the strategy. 5.1 The growth target for both employment and housing is ambitious and will require the strategic sites to be brought forward. Clearly Warren Hall is located closer to Higher Kinnerton and Penyffordd and is likely to have an impact on these settlements and that should be taken into account when considering other housing allocations. 5.2 There are concerns that Phase 2 of the single site school in Penyffordd may be brought forward ahead of the end of the LDP plan period to accommodate additional pupils from both Warren Hall and Higher Kinnerton. We have expressed concern about Phase 2 for a number of reasons, the most significant of which is transport and access. 6.1 Where is the detail of this policy? Clearly sustainable development is a fundamental principle of Planning Policy Wales. This policy aims to facilitate an integrated transport system and ensure sustainable and accessible development. 7.1 We need to be wary of assessments of public transport as a measure of sustainability, without assessing the full extent of the services. For example, the Borderline railway is not likely to electrified during this plan period and with a change of franchise operator, the frequency of service – currently adequate at best – is not guaranteed. 7.2 The local bus services are under-utilised and car ownership is the primary means of transport. Penyffordd has, in the past year, lost one bus service, had another half its frequency of service and has no Sunday service. One of the two remaining services is under threat of closure or further reduction in the frequency of services. 7.3 Community Transport schemes are in their early stages and with Flintshire’s general budget context, are under serious threat with the cost potentially beyond the affordability of Community and Town Councils. 7.4 It would good to see this policy refer to active travel, so that the principle becomes ingrained in policy rather than a ‘tick box’. This policy aims to ensure that new development is supported by necessary and adequate infrastructure whether through CIL or planning obligations. 8.1 Communities are dependent upon CIL payments and they must go beyond education and childrens play areas. Communities need open space, shared community facilities for all ages and basic amenities including improved waste, water, gas, electric and high-speed internet. 8.2 CIL payments are best allocated by Town and Community Councils who are in turn responsible for consulting the Community. Place Plans as SPG are an ideal way to deal with this. This policy seeks to ensure a healthy, vibrant and diverse local economy. 9.1 In Penyffordd there is a suggestion that land be made available for small business units close to the train station. These appear to have been dismissed due to the availability of other employment sites in the County. In practice there are increasing numbers of self employed and small businesses with few affordable, local facilities available. Warren Hall is not likely to bring forward office or workshop space suitable for small growing businesses or start-ups. This policy makes provision for a range of employment land and premises. This policy seeks to support town, district and local shopping centres as multi-functional hubs for local communities. 11.1 There is an urgent need to support retail and other community based enterprise in our local town centres. Retail is changing forever with the shift to online purchasing and town centres have been decimated, particularly smaller centres such as Buckley. This policy sets out a number of principles to be applied in considering different tourism, leisure and cultural development proposals. 12.1 Referring again to the potential commercial sites at Penyffordd train station, which would suit businesses serving passing 4x4, cycling and motorcycle traffic heading for the AONB and National Parks. This policy sets out the approach to and principles to be applied in making provision for viable and deliverable housing development to meet general, affordable and specific housing needs. 13.1 We cannot see the detail of the policy but the principle of enabling existing residents, whether growing families, young people looking for a first home or the elderly downsizing, to find alternative accommodation within their budget is essential. This is a separate issue to homes defined as ‘affordable’ and is why a balanced housing mix is so important. This policy sets out the approach taken in providing for the needs of gypsies and travellers. This policy encompasses a number of strands in seeking to protect both the built and natural environment. 15.1 We need to ensure that heritage buildings are protected as far as is reasonable affordable and practical. Reviewing the history of Penyffordd / Penymynydd and realising the number of heritage / history buildings that have been lost to development is sad – Penymynydd Methodist Chapel, The Towers, Meadowslea, the White Lion, The Royal Oak for example. There are few buildings left which help to define the settlement and provide a sense of heritage. It would be very easy to sweep aside these types of buildings, not suitable for listing, and lose the spirit of a village. 15.2 The natural environment is equally as important, whether it is semi-ancient woodland, as enjoyed between Penymynydd and Dobshill or the agricultural field structures and hedgerows established hundreds of years ago. 15.3 The Penyffordd Place Plan seeks to connect people to the natural environment and heritage around us through the introduction of heritage and nature walks. This policy sets out the ways in which the Plan can help address Climate Change and also deals with other aspects of environmental protection such as flood risk, pollution and energy generation. 16.1 Solar farms and managed woodland are increasingly popular and suitable for land which is unavailable for housing development from which the landowners would like to recover some income – policies should be included for this eventuality. 16.2 More emphasis than ever is needed on the protection of established trees and hedgerows on sites which are granted planning permission. We must stop it being acceptable to remove large proportions of vegetation in order to increase the number of units that can be built on a site. This should be enshrined in policy. This policy seeks to ensure a sustainable approach to managing waste within the County. 17.1 Wales and Flintshire have an excellent record in encouraging household recycling, but this can be further enhanced through designs which allow for space for recycling bins and receptacles. This policy sets out the ways in which the Plan will sustainably manage minerals resources and activity. Are there any other strategic policies that should be included? The Preferred Strategy sets out a comprehensive framework of policies but you may consider that additional strategic policies need to be included? Are there any other comments on the Preferred Strategy? Do you have any comments on other aspects of the Preferred Strategy including supporting documentation? 20.1 The growth under the UDP in Penyffordd is well documented. The settlement grew from 1,340 houses in April 2000 to 1,622 in April 2015, most of them post 2011. 20.2 In the LDP period, Penyffordd has grown by a further 174 houses, including 53 built outside the boundary previously and 40 for which permission has been granted but which are yet to be built. There are a further 32 which are subject to appeal and which FCC are unwilling to contest. 20.3 According to Flintshire County Council, Penyffordd has experienced the highest percentage growth of any settlement in Flintshire. 20.4 In light of the figures shown above for the distribution of houses across the County and the position of Penyffordd in the 3rd tier, the adjacent strategic site at Warren Hall with 300 houses, it is reasonable to say that Penyffordd need not accept any further allocations. 20.5 But the village is realistic about need and in our Place Plan we have acknowledged that some further growth may be necessary – if it of the right type to meet local demand – it equates to a further 37 houses over the plan period (excluding Hawarden Road), but none ahead of the LDP adoption – to allow time for infrastructure to catch up. 20.6 There is genuine concern that the allocated site PEN037, the remainder of Wood Lane Farm, has been designed as a ‘green’ site. Please can you expand on the reasoning and reassure us that it has nothing to do with a developer ready with a plan to bring forward? Our Place Plan 2.2 (reference 3.07) defines this site are being too large and will result in unsustainable levels of growth, particularly if it is developed as a continuation of the Groves development with the same housing density as it is widely speculated to be. 20.7 There is also confusion about PEN038, the current Redrow application site, which was dismissed as an unnecessary incursion into open countryside and an unnatural extension of the settlement in both the UDP inspectors report and the Planning Officers report this year on the Redrow application. The fact that it is considered to be a potential site for inclusion the LDP in the consultation published just days before the start of the Redrow Public Inquiry was, at best, an embarrassment and at worst may have compromised the case. What is the reasoning given the huge public outcry about the Redrow application? 20.8 It would useful to understand the criteria used to determine that a site of this size in a sustainable village and how it is considered compliant with the spatial strategy? 20.9 The other ‘green’ site in Penyffordd is at ‘Beverley’, PEN006. The wishes of the community are that this side of Vounog Hill / Wrexham Road remain green field and the Place Plan 2.2. (reference 3.21) reflects this. We understand from neighbouring properties that since Meadowslea was built there have been problems with drainage on this land, leading to running water at times and therefore it should be designed ‘Amber’. 20.10 On a point of consistency, the planning department’s report on the Hawarden Road application in Penyffordd referred to the Penyffordd Place Plan objective 3.06 which describes the will of the village not wanting developments larger than 25 homes. In the report the officer expressed the opinion that developments of 25 homes were not viable or good use of land. Site PEN006 would yield fewer than 20 houses. Why then does it comply with the spatial strategy and if it is does, then either the Hawarden Road report was wrong or the strategy is wrong? 20.11 There needs to be some more clarity around the criteria used to assess sites. We noted that beyond Penyffordd there are sites as large as 7.7 hectares (Drury), 9.67 Hectares (Drury), 5.18 (Leeswood), 21 hectares (Mancot) and 37 hectares (Mancot) in sustainable villages, yet in another one of 4.49 hectares (Caerwys) is excluded ‘because of the position of the settlement in the hierarchy’. Is there a size constraint or not and how ‘sustainable’ is ‘sustainable’? Due to the contribution already made to housing in the LDP period, no further sites should be considered in Penyffordd / Penymynydd in this plan period. The comments below are made in the interests of being constructive – but do not change this fundamental point. Due to the contribution already made to housing in the LDP period, no further sites should be considered in Penyffordd / Penymynydd in this plan period. 3.21 Vounog Hill Land east of Vounog to be designated as green barrier or green wedge. 3.13 Ensure that the settlement boundary does not extend towards Broughton from Penymynydd particularly in light of the plans for the strategic development of Warren Hall. 6.04 Change of use: Agricultural & Disused Buildings Proposals for the regeneration of derelict sites or alternative use of agricultural buildings within the ward will be supported providing they comply with the requirements of other policies in this plan and where the proposals would not have a detrimental impact on the, rural setting, residential amenity of neighbours and traffic environment. of any of the remaining sites. Concerns over access to the site which would need to be better understood. Concerns over bypass noise. 3.02 The A550 Pen-y- fford bypass (constructed in 1986) does not represent the settlement boundary. Application already submitted for retirement apartments. The expectation is that the authority will recommend refusal. Known drainage issues with this land. 3.07 Candidate sites above 1.6 hectares should be discounted as too large for the settlement. The Plan for 2030 section highlights the candidate sites the community believe should be assessed under the LDP - this does not represent part of this Plan, merely advisory and based on local knowledge. Nor does it represent an endorsement of any of the remaining sites. Concerns over access to the site and known site drainage problems. Planning permission has been granted for 40 dwellings. Although larger scale employment land has been allocated, there is justification for small starter units for local businesses. 6.01 Siting of Businesses Proposals to develop small light industrial, small offce and retail sites close to the A550 / railway station will be supported provided they comply with the requirements of other objectives in this plan. 6.02 The objective is to promote the best sites for business in the ward in respect of road services, sustainable transport for employees and the impact on the surroundings. This site will be available for development from 2020 but not as housing 'windfall'. The community would like some guarantee openspace to ensure the future of community events. The community would like to explore the possibility of using part of the site to house a relocated Spar shop via landswap or incentive. Alternatively the community would like to explore the possibility of re-introducing some healthcare provision in the village on part of this site. 6.08 While many villagers are keen for additional choice and capacity in food retail within the village of Pen-y- ffordd, we must be mindful of the need to protect village size and community life and for businesses to be sustainable and appropriate for the village/ward resident numbers. New retail premises must fit into the feel of the village and not cause a reduction in the quality of life of existing and future residents. 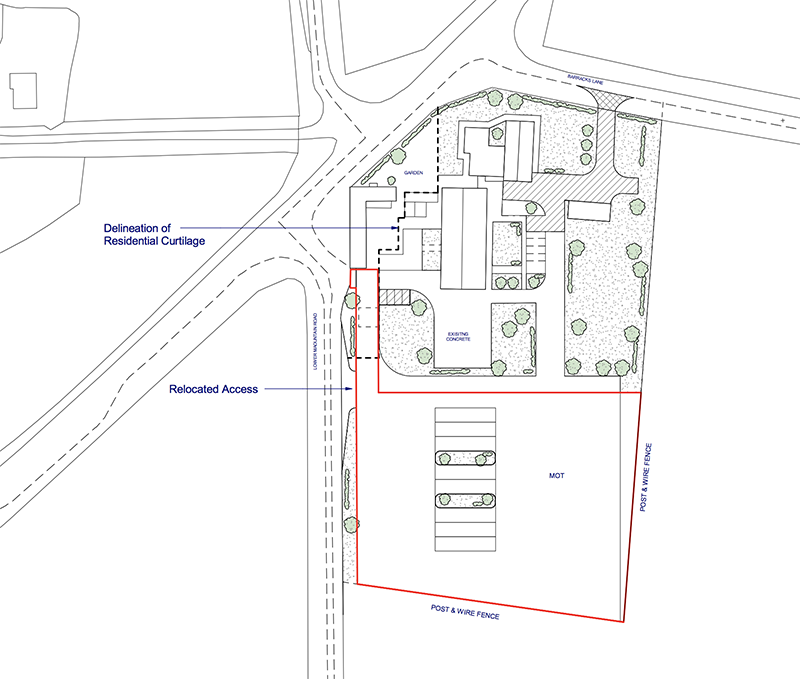 Proposals for the re-introduction of a healthcare facility in the village would be welcomed where the design is of a scale and design fitting of a village environment, provide adequate parking provision and a robust tra c plan. They must not have a detrimental impact on the residential amenity of neighbours including issues of noise, traffic congestion, smells and vibration. Planning permission has been granted for 5 dwellings but we understand there is a problem with agreeing S106 contributions. The Council are keen to bring forward this development. 3.26 The former clinic on Melrose Close need to be reused for development or open space - it should not remain in the current state. Site has been agreed as the location of the single site school, subject to planning permission. See PEN031 - the location of the Spar on this site is not sustainable and proactive efforts are needed to relocate the grocery store within the village, potentially off-Chester road on the old school grounds. This site could be used for affordable housing potentially in a land-swap arrangement. It is not clear how this site complies with the Spacial Strategy where others do not. The community have been suspicious about the intentions for this land since the access road was built and the application went in on the Hawarden Road site. There are serious concerns about access, the loss of agricultural land, the use of the by pass as a boundary and above all the size of the potential development - potentially over 100 home is not sustainable in a single development. The will of the village that there is no more growth under the LDP but if developments are permitted, the maximum acceptable size of an individual site must not exceed 25 homes. 3.02 The A550 Pen-y-fford bypass (constructed in 1986) does not represent the settlement boundary. Application for 186 houses is ubject to a public inquiry and considered an excessive incursion into open countryside and too large to be sustainable in both the UDP inspectors report and the Planning Officers report on the Redrow application. Should have been a 'red' does not comply with the strategy in this consultation. 21.1 The disused Council depot site at Dobshill – DOB004 is already earmarked by the Council for development of 24 affordable homes. Dobshill should have no other growth aside from this Council development. Place Plan References 3.08 Growth in Dobshill is limited to development of the brownfield former council depot only; 3.24 Dobshill depot needs to be reused for development or open space – it should not remain in the current state.